Most things you read about 3D printing are about how it will change the nature of mass-produced products when you can run one up in your own home instead of going to the shops – the Star Trek replicator analogy. But perhaps the truly revolutionary thing about 3D printing is the capacity to individualise things: And there’s nowhere that’s more obvious than in the medical field. On top of being specifically designed to provide support where it is needed, the result just looks fabulous. It wouldn’t be hard to imagine this being suggested as a fashion accessory rather than a medical device. For lots of lovely pictures and more details take a look at Jake’s site here. 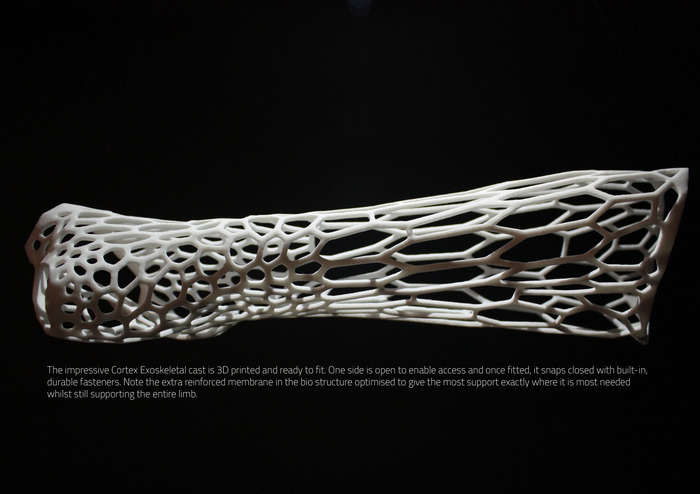 Image copyright Jake Evill and Cortex Cast systems.